Herbs are the leafy greens or the flowering parts of plants. They are commonly used as food, flavoring, perfume and medicine. 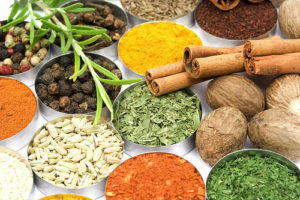 In culinary, herbs are used in small amounts to provide flavor and aroma, unlike common vegetables which are used as substance to food. Herbs are truly nature’s super foods. They are nutrient-dense, calorie-free and have amazing benefits. The incredible taste and aroma of herbs make Paleo diet recipes nutritious and appetizing. Some popular herbs used in cooking are cilantro, thyme, oregano, mint, rosemary and basil. Herbs have numerous benefits and uses. Herbs contain nutrients that are known to boost brain function, speed up healing, maintain healthy skin, support anti-aging and improve overall health. Because most herbs are high in antioxidant levels, they can help fight against cancer by protecting the body from the dangerous effects of oxidative stress. The antioxidants in herbs can also protect against microbes. Some herbs are used as remedy for toothaches, nausea, upset stomach and more. Some herbs are used to make extracts. An example is peppermint which can be an effective treatment for digestive problems such as IBS. There are many different kinds of herbs and the most popular ones are the healthiest. Rosemary is one of the most common herbs around. It has a strong pine flavor normally used on grilling meats and chocolate desserts. It is very versatile that it can go well with almost any dish and has amazing health properties including its ability to boost brain function. Rosemary contains a compound called rosmarinic acid that is responsible in improving long-term memory. It also contains carnosol, a nutrient that help fight fatigue. This herb has a robust taste and can either be used fresh or dried to add flavor to soups, vegetables and meats. Oregano is common is Mediterranean and Mexican cuisine. It contains high levels of antioxidants, and is known for its antibacterial properties, that can help kill bacteria such as E.coli. The antioxidants found in oregano has the ability to reduce formation of carcinogenic compounds in meat. Mint has a warm, fresh, aromatic and sweet flavor. It is often used in teas, beverages and ice creams and as garnish for certain dishes. Not all people are fond of using it in dishes because of its cool aftertaste (this is true for spearmint) but mint has qualities that are beneficial for health. Mint is commonly used to combat nausea. It has anti-inflammatory properties that helps soothe headaches, coughs and colds and even skin irritations. Thyme is an evergreen herb known for its, culinary, medicinal and ornamental uses. It contains high levels of antioxidants that fight against free radicals, slowing the aging process and protecting against certain diseases. It is also used to treat respiratory problems. Thyme is also used as antiseptic. Compared to other herbs, thyme retains its flavor on drying. Basil is another culinary herb known as king of herbs. It is commonly used fresh in most recipes because cooking can destroy its flavor. It is one of the main ingredients of pesto. Its taste is distinct so it is not commonly used in most dishes. But basil is an excellent source of nutrients that can help bosst immunity. It is one of the few herbs that contain omega-3 fatty acids that have brain and heart health benefits. Basil, like other herbs, is rich in antioxidants that can aid in reducing risk of tumor growth. This herb has a similar taste to anise, licorice, mint and pine and is particularly used as a flavoring for chicken and seafood. Tarragon contains rutin which is known to help lower cholesterol levels by boosting circulation and reducing plaque in the arteries. Cilantro has a light, fresh flavor and is often used fresh rather than dried. It is a regular in Mexican and Indian cuisine and has a good use in marinades for meat grilling. It can work well with salad, salsa and smoothies. Cilantro is known for its ability to maintain blood sugar level. Its antioxidants have anti-inflammatory and antibacterial properties. Bay leaf has a woody taste which makes it a staple for soups, stews, sauces and pot roasts. It is a natural pain reliever herb that can treat headaches and migraines. This is because of the compound present in it called eugenol, a natural anesthetic. Sage is listed as one of the essential herbs together with rosemary and thyme. It has a savory and slight peppery taste common is European dishes. Sage contains phytonutrients that supports memory function. It also contains rosmarinic acid like rosemary, which can protect agains oxidative damage. Is there Any Concern with Herbs? There are no concerns with usage of herbs in the Paleo diet. Unlike vegetables, herbs are usually consumed in small amounts, most often as flavoring. But do not underestimate the power of herbs as they are all-natural, healthy plant foods. They make a great addition to dishes and provide benefits that can help achieve the body’s optimal health. Ultimate Paleo Guide. Are Herbs Paleo?